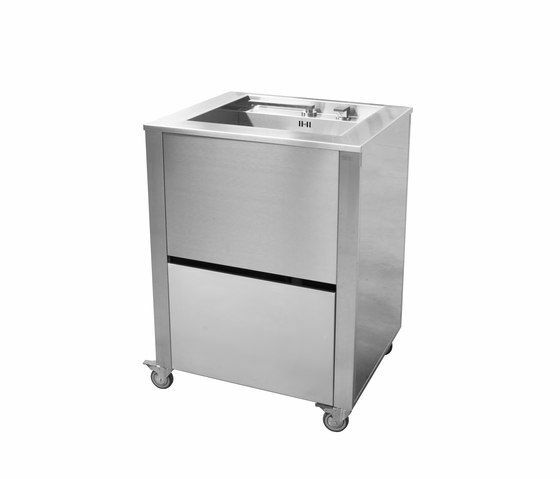 692 x 604 x h950 mm stainless steel Cunkitchen sink stainless steel ___ Stainless steel kitchen cart of the series Cunkitchen with sink. The sink is seamlessly welded to the worktop, the use of a telescopic pull up tap helps to optimize storage or covering of the cart. The cold water inlay (quick coupling garden hose style) and the drain (diameter 40mm) are placed on the bottom of the cart. The drawer is handleless and can be easily detached for cleansing. The cart has a easy fit system for quick fitting of accessories or a connection board on the left and on the right.